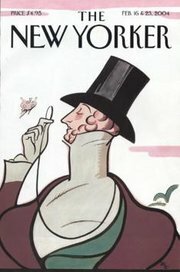 In early October, The New Yorker magazine held its eighth annual festival in NYC. (Yikes! As I am typing I'm feeling my first earthquake here in California. Apparently 5.7 on Richter scale. Details here.) Anyway, the festival brings to the stage an impressive list of writers & artists (see the full schedule here). And while the average New Yorker had to pay somewhere between $16 and $100 to attend the various events, you can now watch a select number of them for free. The free videos feature New Yorker editor David Remnick speaking with Seymour Hersh about his investigative journalism and America's involvement in Iraq and Iran; Nobel Prize winner Orhan Pamuk and Salman Rushdie discussing how they approach writing about their respective homelands, Turkey and India; and Martin Amis and Ian Buruma making sense of historical "monsters" and the psychology that drives evil. Also Philip Gourevitch leads a quite thought-provoking conversation with Errol Morris about Abu Ghraib and what did and did not happen there. (Abu Ghraib is the subject of Morris’s next film.) Then, on the lighter side, comedian Steve Martin amuses the crowd by showing clips of his stand-up performances, and filmmaker Judd Apatow talks with film critic David Denby about his new comedy "Knocked Up." You can access these video talks in one of three ways. Watch them online right on The New Yorker web site; head over to Itunes where you can download them as video podcasts; or work with the video rss feed. For more jazz, check out our collection of Music Podcasts which includes a decent selection of, yes, jazz podcasts. Earlier this month, The New York Times Book Review launched an online Reading Room that lets readers tackle great books with the help of "an all-star cast of panelists from various backgrounds—authors, reviewers, scholars and journalists." The first reading starts with Leo Tolstoy's 1200+ page epic, War and Peace (1865-69), and it's led by book review editor Sam Tanenhaus and a supporting crew consisting of Bill Keller (executive editor of The Times), Stephen Kotkin (a Russian history professor at Princeton), Francine Prose (author of Reading Like a Writer), and Liesl Schillinger (a regular reviewer for the Book Review). At the outset, Sam Tanenhaus' introduction leaves the impression that the "Reading Room" will offer a fairly structured reading of Tolstoy's text. But that's not exactly how things turn out. Often quite fragmentary, the conversation mostly operates outside the text itself and veers in many different, though often intriguing, directions. 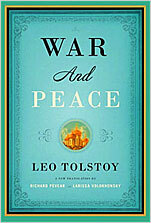 At one moment, Francine Prose tells us that Tolstoy's account of the Napoleonic wars reminds her of today's war in Iraq. For Bill Keller, it evokes the waning days of the Soviet Union. And, for Liesl Schillinger, it's her youth in 1970s America. (You can get a feel for the flow and focus of the discussion here.) Ultimately, what you think of this new project depends on what you want to get out of the experience. If it's a more structured reading (as we were hoping), then you may not be completely engaged. But if it's a more free-flowing conversation that moves in and around great works, then you'll want to join the conversation. And, yes, there's a role there for the everyday reader too. Take a look at the Reading Room and let us know what you think. This sneaked up on us. Today marks the one year anniversary of our site. All in all, it's been a decent maiden voyage. Last October, we started with the concept that the web abounds with great cultural/educational media, but no one's really focusing on these smart podcasts/videos and providing users with a free and easy way to continue expanding their cultural horizons. So that's what we started to do. The numbers suggest that we're satisfying some kind of need. We racked up a couple million page views this year (not bad for a fledgling site), with users coming from across the globe. Along the way, we got some nice mentions in the press -- Smart Money (by the Wall Street Journal), The Christian Science Monitor, Der Spiegel (Germany), and El Pais (Spain). And there were other mentions on the big blogs - Lifehacker, Boing Boing, The Unofficial Apple Weblog, etc. -- and a couple of interviews on public radio (here and here). We're looking forward to Year 2, when we'll hopefully get more writers and guest bloggers in the mix and launch a podcast of our own. (We'll see if time permits.) If you have thoughts on how we could improve, please feel free to contact us and give us your thoughts. We'd genuinely like to get your feedback and find new ways to do things better. We hope that you'll continue to visit during this upcoming year. Ciao. Human Species May Split into Two: Life Imitates Art Again? Here's a zinger to mull over: The BBC has posted an article about a theory advanced by Oliver Curry, an "evolutionary theorist" working out of The London School of Economics, who suggests that humanity may split into two sub-species about 100,000 years down the road. And what we'd be left with is "a genetic upper class" ruling over "a dim-witted underclass." This is a scenario, of course, that HG Wells laid out in his 1895 classic, The Time Machine (listen to free audiobook on iTunes here). And, if Curry's theory holds water, Welles may offer the most extreme example of science fiction anticipating the shape of the future. Does Curry's theory have anything to it? We haven't the foggiest. But does it make for strangely compelling yet disturbing reading? It sure does. See our Science Podcast Collection as well as our collection of Audiobook Podcasts. It's been an unspeakably bad week throughout much of fire-ravaged Southern California. As of Thursday, the toll looked liked this: 500,000 acres burned; 1,800 homes destroyed; 57 people injured and at least six killed. As all of this transpires, a new book has come out that gives you an inside look at firefighters who make their living battling natural wildfires. 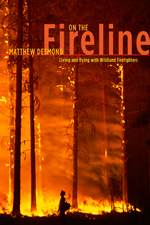 On the Fireline: Living and Dying with Wildland Firefighters is written by Matthew Desmond, who spent four years tackling these blazes. And, in this lengthy free excerpt you get graphically exposed to the risks and losses that they experience professionally and personally. It certainly makes you feel for the firefighters on the frontlines this week, and we wish them and our fellow Californians the best.